Tomorrow, ladies and gents, is it. I’ve been training for over 6 months and I feel 99.97% ready for my first half marathon. That last 0.03% of doubt consists mainly of the “what ifs” that have been swimming around my See ‘N Say brain. What if I get this super duper migraine the day of the race? 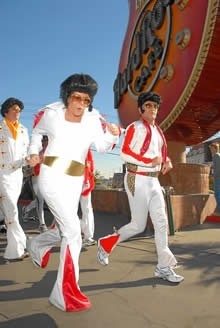 What if I slip on a banana peel that one of the running Elvises dropped? Fingers crossed that none of the above occur! Then another voice says, “Whoa there cowgirl, let’s not get ahead of ourselves. Get through tomorrow first.” That voice sounds a lot like my husband… and looks like him too! See you on the flip side! Wish me luck! LOL! Too funny! You will do awesome:) Good Luck! I hope to be where you are now, sometime next year. You are such an inspiration!!!!!! !